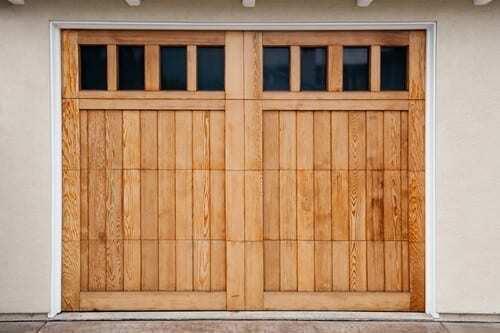 A garage door is important because it secures your vehicle, property, and other valuables from the reach of intruders. According to the U.S. Department of Justice, 1.03 million home invasions occur each year. With this in mind, you can’t afford to take chances when it comes to your garage door and the safety of your home. Carriage house garage doors not only add value and security to your home, but also a significant impact on the aesthetic value of your property. Absolute Overhead Door features a variety of garage door styles for your convenience. Carriage house doors are a style of enduring quality and timeless design. They’re designed to resemble historic carriage house doors that swing, fold or slide. Yet, they still maintain the convenience of modern-day technology. Carriage house doors are a great option if you’re looking for something with a distinctive style that combines old-world design and modern technology to give your home a tasteful and classic appearance. Above all, still ensuring it maintains the high quality and security of other Absolute Overhead Door products. Most noteworthy, carriage house garage doors add style and vintage modernity that is sure to increase your home’s aesthetic appeal, without overstating the other features of your home.